If you are interested in what we are up to on the Social Studies trip go to: http://mryeska.blogspot.com/ for information and pictures from the trip. At the moment we are en route to Gettysburg, Pennsylvania for the day. Have a great week and we will see you soon. Good Morning. We are having a two hour delay today due to blowing snow and road conditions. February 21, 2019 Between the “polar vortex”, large snowfalls, extreme cold weather and icy road conditions, our severe weather this winter season has caused multiple days of school closure. We have reached the point where we need to make up missed instructional time according to the requirements set forth by Wisconsin Department of Public Instruction. Beginning March 5, 2019, we will increase the instructional day by 10 minutes through May 3, 2019. We will continue with our normally scheduled start time and students will be dismissed 10 minutes later each day during this period. From this point forward any additional cancellations or delays will require us to make up the instructional hours/minutes with students. All information regarding any additional make up time will be communicated to parents/guardians by means of a District Letter, District automated messages, District website and the School District of Wild Rose Facebook page. We appreciate your understanding and we look forward to working with you during this change in schedule. ATTENTION- WILD ROSE HIGH SENIORS and their PARENTS! Your graduation cap/gown/announcements will be delivered at school on Wed., Feb. 27th @ 2:54. PLEASE NOTE if you have a payment due - Credit/Debit Card payments MUST be made at least 24 hours BEFORE this delivery date either online @ jostens.com or by phone @ 1-800-567-8367. CHECKS AND CASH ONLY will be accepted on delivery day. Questions-Please contact us @ 1-800-567-8367. Good Evening. School is canceled tomorrow, Tuesday 2/12 due to the predicted weather forecast and road conditions. WildCat Booster Club meeting for tonight has been postponed to next Sunday at 5:30 in the HS IMC due to the weather. Good Morning. We are canceling school today due to road conditions and predicted weather forecast. Good Morning. The road conditions have not improved and are still icy. We are closing school today. Good Morning. We are having a two hour delay today due to icy road conditions and fog. February Breakfast and Lunch menus have been added to the Website and App. A message from Wild Rose Schools. After carefully monitoring the predicted cold temperatures and wind chills that are continuing to stay in our area, the decision has been made to close school Thursday, January 31. We are receiving predictions from the National Weather Service of wind chill temperatures continuing to be -30°F to -55°F for Thursday morning. We believe canceling school is the safest option for students and staff. A message from Wild Rose Schools. All After School Activities will be canceled for today. After carefully monitoring the predicted cold temperatures and wind chills that will be moving into our area, the decision has been made to close school Wednesday, January 30. We are receiving predictions from the National Weather Service of wind chill temperatures reaching -30°F by Tuesday evening, approaching -55°F on Wednesday morning. We believe canceling school and after school activities is the safest option for students and staff. We will evaluate the conditions tomorrow and make a decision about Thursday to ensure enough time for families to make any necessary arrangements. The Social Studies Trip parent meetings scheduled for this week, have been rescheduled for next week Tuesday and Wednesday. Any questions contact Mr. Yeska. Good Evening. Wild Rose Schools will be closed tomorrow, Monday, due to the anticipated snow storm. The Wild Rose Fitness Center will be closed tonight and tomorrow morning. A message from Wild Rose Schools. We are closing at 1:00 PM today due to weather conditions. The Wild Rose Fitness Center will be closed tonight (Monday, 12/10 PM Shift). We are inviting the Wild Rose School Community to please support our talented musicians for their upcoming concerts. Wild Rose High School Winter Concert will be Monday Dec. 10, at 7:00 pm. Wild Rose Middle School Winter Concert will be Monday Dec. 17, at 7:00 pm. The December Breakfast and Lunch menus have been added to the website and mobile app. School Bus number 11 route is running late this morning. We have sent a replacement bus. The route is running approx. 30 min. late. The Phone system is back up and working again. We apologize for the inconvenience and thank you for your patience. Good Morning. We are experiencing a few problems with our phone system. We are not able to take phone calls at this time. Please use the following numbers: MS/HS 920-765-1587, WRE 920-240-6452. We have openings for Substitute Bus Drivers. Training is provided and reimbursement of cost of license. Please contact D. Smith 622-4203 x. 1400. Wild Rose is an equal opportunity employer & educator. The High School Volleyball games will be played at the Elementary School tonight. Good Afternoon - the Fitness Center will be closed tonight! We have openings for Full Time Bus Drivers. Training is provided and reimbursement of cost of license. Please contact D. Smith 622-4203 x. 1400. Wild Rose is an equal opportunity employer & educator. Fitness Center closed tonight. There is no power in the facility. We have openings for Full Time Bus Drivers. Training is provided and reimbursement of cost of license. Please contact Debi Smith 622-4203 x. 1400. Wild Rose is an equal opportunity employer & educator. June 6, 2018: Last Day of School! Attention SADD students going on trip Friday. Bus will be leaving at 8:15 from Front Lobby. 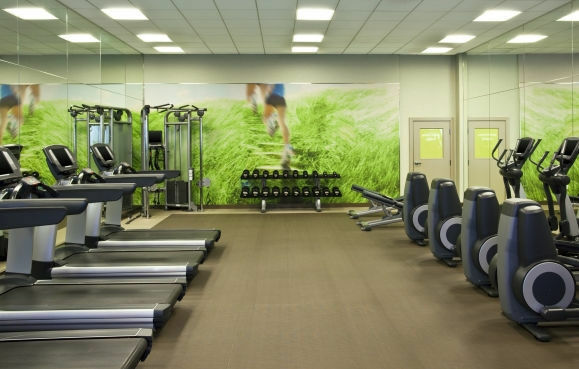 The Fitness Center will be open Monday - Thursday mornings during the summer from 7:00am - 9:00am, starting Monday, June 11, for any Wild Rose students. If you plan to use the fitness center, participate in any open gyms or camps, a waiver form needs to be filled out and turned into the office. The waiver forms can be found in the high school office. Any student planning to participate in athletics next year, all of your paperwork can be found in the high school office in a personalized folder. Please stop in and pick up that paperwork and get it filled out. The School District of Wild Rose has openings for Full Time Bus Drivers. Training is provided and reimbursement of cost of license. Please contact Debi Smith (920) 622-4203 ext. 1400. The School District of Wild Rose is an equal opportunity employer & educator. Thank a teacher! As we are nearing the end of the school year we would like to take the time to have the students share their thoughts and "Thank A Teacher" with a quote or why they are an awesome teacher. Any students that are attending the SADD field trip, we will be leaving at 8:15 on Friday June 8th from the high school front lobby entrance. Thank a teacher! As we are nearing the end of the school year we would like to take the time to have the students share their thoughts and "Thank A Teacher" with a quote or why they are an awesome teacher. Congratulations to the boys and girls track teams that competed at state this weekend. The boys teams finished 2nd overall and Ashton Schwartzman was the 400m champion. Any students that are attending the SADD field trip, we will be leaving at 8:15 on Friday June 8th from the high school front lobby entrance. June 1, 2018: Thank a teacher! As we are nearing the end of the school year we would like to take the time to have the students share their thoughts and "Thank A Teacher" with a quote or why they are an awesome teacher. It will then get shared out on Facebook through the end of the school year and throughout the summer. Please email Mr. Nelson if you would like to Thank a Teacher with a special note. There will be extra copies of the yearbook available for purchase, but these go fast! Make sure you get your copy before they sell out. Baseball Regional Final tonight in Almond. Game time 4:30 PM. Good Luck WildCat Baseball Team! Girls Soccer Regional Game tonight in Amherst @ 5:00 PM. Good Luck Soccer Girls! May 31, 2018: Thank a teacher! As we are nearing the end of the school year we would like to take the time to have the students share their thoughts and "Thank A Teacher" with a quote or why they are an awesome teacher. There will be a meeting for any 8th-11th grade boys interested in playing basketball next year in Mr. Murphy's room during CATS on today. If you are unable to sign up, please contact Mr. Murphy. Students: Make sure to save your Wildcats Way tickets. For each 10 tickets you turn in, you get one entry into a prize drawing. There will be extra copies of the yearbook available for purchase, but these go fast! Due to the weather and field conditions, the Regional Baseball game in Almond today has been postponed until tomorrow at 4:30. May 30, 2018: Thank a teacher! As we are nearing the end of the school year we would like to take the time to have the students share their thoughts and "Thank A Teacher" with a quote or why they are an awesome teacher. There will be a meeting for any 8th-11th grade boys interested in playing basketball next year in Mr. Murphy's room during CATS on Thursday, May 31. Missing Flute. If anyone has information on the whereabouts of a missing flute, please see Mr. Nelson. Students: Make sure to save your Wildcats Way tickets. For each 10 tickets you turn in, you get one entry into a prize drawing. May 29, 2018: Thank a teacher! As we are nearing the end of the school year we would like to take the time to have the students share their thoughts and "Thank A Teacher" with a quote or why they are an awesome teacher. There will be a meeting for any 8th-11th grade boys interested in playing basketball next year in Mr. Murphy's room during CATS on Thursday, May 31. Students: Make sure to save your Wildcats Way tickets. For each 10 tickets you turn in, you get one entry into a prize drawing. There will be extra copies of the yearbook available for purchase. May 24, 2018: Seniors who did not turn in a Chromebook yesterday, please bring it to the office and check it out today. High School students: Pick up your academic letter application in the HS office. Any Middle School Track Athlete interested in participating the 2018 Badger State Games should see Coach Yeska for more information. Students: Make sure to save your Wildcats Way tickets. For each 10 tickets you turn in, you get one entry into a prize drawing. May 23, 2018: Seniors: You are handing in chromebooks today during CATS and then reporting to your scheduled CATS time. Make sure you have your power cord. High School students: Pick up your academic letter application in the HS office. Completed forms are due to Mrs. Ogden no later than 3:00 Thursday 5/24. Students: Make sure to save your Wildcats Way tickets. For each 10 tickets you turn in, you get one entry into a prize drawing. Seniors, your check out sheets are on the counter in the high school office. May 22, 2018: High School students: Pick up your academic letter application in the HS office. Completed forms are due to Mrs. Ogden no later than 3:00 Thursday 5/23. There will be a meeting for any 8th - 11th graders that are interested in playing football next year in the Cafeteria on Tuesday, May 22. Students: Make sure to save your Wildcats Way tickets. For each 10 tickets you turn in, you get one entry into a prize drawing. Yearbook staff will be distributing yearbooks today, May 22nd. May 21, 2018: There will be a meeting for any 8th - 11th graders that are interested in playing football next year in the Cafeteria on Tuesday, May 22 during CATS. Students: Make sure to save your Wildcats Way tickets. For each 10 tickets you turn in, you get one entry into a prize drawing. Poetry Slam Participants. Please report to Mrs. Miller's room Monday 5/21 (today) during CATS...after you have signed up for your week's CATS...for pictures. Yearbook staff will be distributing yearbooks tomorrow, May 22nd. School District of Wild Rose Rummage Sale @ Wild Rose Elementary - Saturday, May 19 from 7:00-11:00 AM. May 16, 2018: Any boys in 8th - 11th grade interested in playing soccer next fall, please sign up in the high school office by the end of lunch on Friday, May 18. If you have any questions, please see Mr. Murphy. Attention SADD students don't forget that Wisconsin Dells Trip forms and money are due this THURSDAY to MS. Dohr. Quick turnaround for this trip, permission slips due THIS WEEK! May 15, 2018: Congratulations to the Boy's and Girl's track teams on bringing home conference championships last night. Congratulations to the Middle School Boys and Girls Track Teams for winning the Rosholt Invitational last night. The boys were 24 points better than 2nd place Pacelli, while the girls team scored 218.5 points and took first in 10 of the 13 events. May 14, 2018: There will be a volleyball meeting for all girls 8th grade to 11th grade in Mr Kirby’s classroom on Wednesday May 16th during cats. 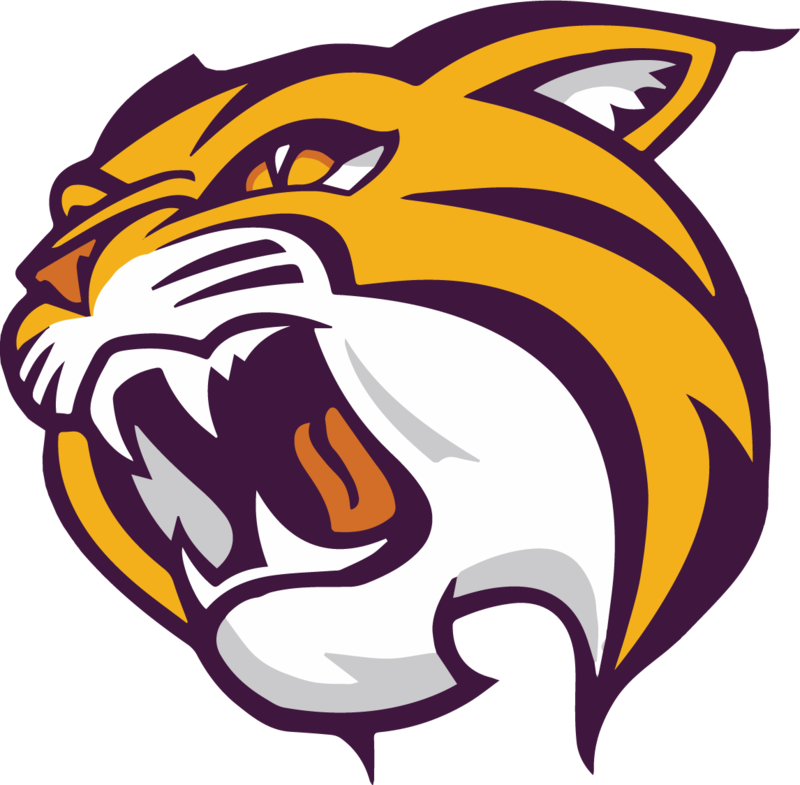 Middle school students interested in playing football next fall sign up for Mr. Ebben's Wednesday CATS time. Seniors, be sure to check your email for directions on how to transfer your school Google account to a personal Google account. ATTN: High School Students - Do you think you have what it takes to run your own business? Put your skills to the test at one of these Summer Business World Programs and bring a friend with you. The Summer Business World Program is offered at @UWMadison, @St. Norbert and @UW Stevens Point from June to July. Sign up now: https://www.wmc.org/programs/business-world/summer-program/. The last Art & Design Club meeting of the school year will be held in the Art & Design room during Lunch this Tuesday. Due to poor field conditions, the Softball Tournament in Tri-County on Saturday has been canceled. Waushara Olympics has been canceled for Friday. They will not be rescheduling the event. May 9, 2018: There will be a meeting for any 8th through 11th grade students interested in joining the Cross Country team next fall on Thursday May 10th, during CATS in Mr. Yeska's room. Congratulations to the Middle School Boys & Girls Track teams for winning yesterday's 6 team home meet. Two new Middle School Records were established yesterday. A huge congratulations to Ethan for setting a new record in the 800 with his time on 2:10.25, and the Girls 4x200 Team with their time of 2:06.46 Take time today to make someone else’s day. Say something nice, do something nice, or just simply be nice. There will be a meeting for any 8th through 11th grade students interested in joining the Cross Country team next fall on Thursday May 10th, during CATS in Mr. Yeska's room. Congratulations to the track teams on their dominating performances last night. Today is National Teacher Day. Be sure to tell a teacher today that you appreciate all that they do for the students in Wild Rose. Take time today to make someone else’s day. Say something nice, do something nice, or just simply be nice. May 7, 2018: There will be a meeting for any 8th through 11th grade students interested in joining the Cross Country team next fall on Thursday May 10th, during CATS in Mr. Yeska's room. Take time today to make someone else’s day. Say something nice, do something nice, or just simply be nice. Congratulations to the girl's and boy's track teams on placing 1st @ the 7 team meet in TC Tuesday night. Congratulations to the Boys and Girls Middle School Track Teams on their 1st place finishes at the 7 team Wautoma Invite last night. There will be a meeting for any 8th through 11th grade students interested in joining the Cross Country team next fall on Thursday May 10th. Congratulations to ALL of the poets who performed during the 2018 Poetry Slam!! Take time today to make someone else’s day. Say something nice, do something nice, or just simply be nice. April 30, 2018: Congratulations to the Middle School Boys and Girls Track teams for winning the 11 team CWC Invite in Iola on Saturday, both for the second year in a row! Many personal bests were set, and it was a GREAT Day to be a WILDCAT! Congratulations to the boy's and girl's track teams on taking home the team title @ Back the track invite in Rosholt on Friday. April 25, 2018: Attention all HS students you really don't want to miss out on this year's Post Prom! Everything is Free sponsored by local business and The Post Prom committee. We have an early release today at 1:53pm. The schedule is attached to the announcement email. April 24, 2018: Attention all HS students you really don't want to miss out on this year's Post Prom! Everything is Free sponsored by local business and The Post Prom committee. If you are bringing a guest they need to have a guest form signed and if you are attending post prom you need to sign up and have a permission form signed and returned. Congratulations to the HS Forensics Team on their state performances this past weekend at UW-Madison. Georgia -gold, Ivy -gold, Nevaeh -gold, Abi -gold, Kaydee -gold, Margaret -bronze. April 18, 2018: Prom and Post Prom are just a few weeks away on April 28th/29th. If you are bringing a guest they need to have a guest form signed and if you are attending post prom you need to sign up and have a permission form signed. All materials are in the office for you to sign up. Prom and Post Prom are just a few weeks away on April 28th/29th. If you are bringing a guest they need to have a guest form signed and if you are attending post prom you need to sign up and have a permission form signed. Congratulations to this years Visual Art Classic State competitors. They did a great job competeing at UW-Madison this last Friday. Georgia Robbert scored two 2nds in Drawing. Kali Sipp also brought home a 2nd in Drawing. Jessica Ramirez recieved two 2nds in Painting. Aven Wagner brought home a 2nd in Painting. Dakota Guist took a 2nd in Ceramics. Lizeth Barbosa topped of the day with a 1st in Personal Adornment. Once again Congratulations on a job well done. It was another exciting fun year for the VAC team. Wild Rose Schools will be closed Monday due to road and weather conditions. The Fitness Center will be closed Monday morning due to weather conditions. Fitness Center will be closed today due to weather conditions. Due to the weather the Baseball, Softball and Soccer games have been canceled for today. Prom and Post Prom are just a few weeks away on April 28th/29th. If you are bringing a guest they need to have a guest form signed and if you are attending post prom you need to sign up and have a permission form signed. All seniors must reserve their spot on the senior class trip with $5 to either Mrs. Gerloff or Miss Strasser by this Friday so we can make reservations. Final numbers for flowers are also due this Friday. April 11, 2018 Prom and Post Prom are just a few weeks away on April 28th/29th. If you are bringing a guest they need to have a guest form signed and if you are attending post prom you need to sign up and have a permission form signed. All materials are in the office for you to sign up. April 10, 2018: Prom and Post Prom are just a few weeks away on April 28th/29th. If you are bringing a guest they need to have a guest form signed and if you are attending post prom you need to sign up and have a permission form signed. Take time today to make someone else’s day. Say something nice, do something nice, or just simply be nice. April 9, 2018: Congratulations to the boy's and girl's track teams on their performances @ UWSP indoor meet on Friday. The boy's placed 2nd and the girl's 7 out of 21 teams. A reminder to all sophomores that the Java Joes fundraiser orders and money are due on today to Mrs. Bechard. Take time today to make someone else’s day. Say something nice, do something nice, or just simply be nice. 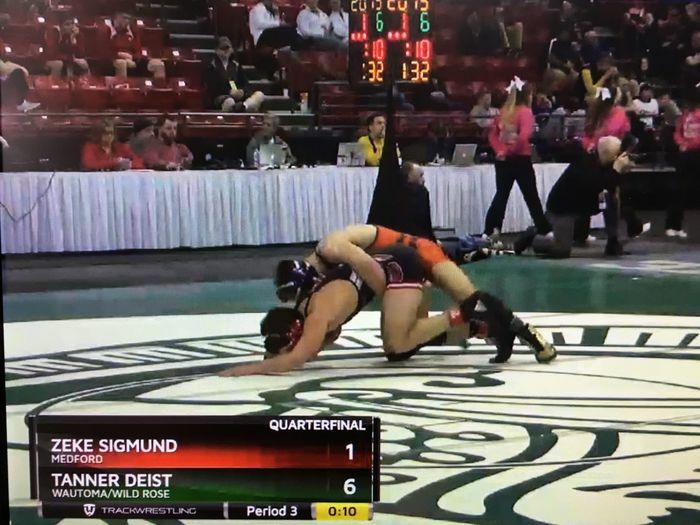 April 4, 2018 Congratulations to Tanner Deist. Tanner has been selected as one of 32 finalists in the statewide WIAA Scholar Athlete Program. This year 861 seniors from more than 446 high schools were nominated. To be named as a finalist is a testimony to the excellence you’ve displayed in the classroom and as an athlete. Wild Rose Fitness Center closed tonight - Tuesday, April 3, 2018. Good Morning- A message from Wild Rose Schools. We are closing early today due to anticipated weather conditions. Elementary schools dismissing @ 12:35 and Middle/High school dismissing @ 12:45. April 3, 2018: Any students who have Booster Club Raffle Tickets - sold or unsold - need to return them to Mr. Murphy or Mr. Yeska by the end of the day Wednesday. The moped raffle is Wednesday night. Thank you to all who sold tickets this year. Middle School Students: 4th quarter wheel classes will be posted on the middle school conference room today. Take time today to make someone else’s day. Say something nice, do something nice, or just simply be nice. March 27, 2018 Students if you are interested in seeing a Broadway production of Les Miserables please pick up information in the High School office. Attention SADD students: Our Kringles will be delivered on Wednesday. The whole team needs to go to the Art & Design room for picture during lunch today. March 22: Attention Winter Sports Athletes: Just a reminder that the Winter Sports Banquet will be tonight. Students if you are interested in seeing a Broadway production of Les Miserables please pick up information in the High School office. Key Club will be having a meeting today at lunch. A meeting for Archery Club members today @ 12:30 in sports lobby. Attention students going to Madison Percussion Extravaganza this Saturday. Our bus will be meeting on the Sports Lobby/Teacher Parking Lot side of building at 9:45 am. AP Exam fees are due to Mr. Nelson by March 23rd. March 21: Attention Winter Sports Athletes: Just a reminder that the Winter Sports Banquet will be Thursday, March 22. Students if you are interested in seeing a Broadway production of Les Miserables please pick up information in the High School office. Key Club meeting will be on Thursday the 22nd at lunch. All archery club members interested in the video archery trip: A meeting will be held during lunch tomorrow @ 12:30 in sports lobby. Percussion Extravaganza this Saturday. AP Exam fees are due to Mr. Nelson by March 23rd. March 20, 2018: Students if you are interested in seeing a Broadway production of Les Miserables please pick up information in the High School office. Students of the Month: 6th grade: Abbie M, 7th grade: Serena T, 8th Grade: Paige D High School: Lizeth B & Brandon H. AP Exam fees are due to Mr. Nelson by March 23rd. March 19, 2018: Oakwood Campgrounds is looking for summer help. They have multiple positions open. Please see Rosie for the contact information. A reminder to all Middle School Track Athletes please get any forms turned in to Coach Yeska ASAP. The season starts tonight. Congratulations to the boy’s and girl’s track teams on their strong showing @ the UWSP indoor meet. The following placed @ the 40 plus team meet Candice Milne- 400 4x200 M relay team- Caswell, Bennot, Marquez, Lauritzen Caleb Williams- TJ Alec VandeCastle- LJ 4x800 M relay- Dorsett, Schwartzman, Erdman, & Wood Ashton Schwartzman- 400 David Lauritzen-60M 4x400M relay- Schwartzman,Schwartzman, VandeCastle, & Friday 4x200M relay- VandeCastle, Friday, Lauritzen, & Cronkrite Great job Coach Williams & Coach Bahr AP Exam fees are due to Mr. Nelson by March 23rd. Wild Rose Middle and High School Testing Schedule - March 20th: 10th grade will take Social Studies session 1 and 2 during 6th & 7th hour. March 21st: 8th Grade will take Social Studies session 1 & Science session 1 during their regular History & Science class periods. March 22nd: 8th Grade will take Social Studies session 2 & Science session 2 during their regular History & Science class periods. March 27th: 6-8th Grade will take Mathematics sessions 1 & 2 from 8:30-11am. March 28th: 6-8th Grade will take English Language Arts sessions 1 & 2 from 8:30-11am. March 29th: 6-8th Grade will take English Language Arts sessions 3 & 4 from 8:30-11am. March 19: Students if you are interested in seeing a Broadway production of Les Miserables please pick up information in the High School office. Reminder to all SADD students: Kringle Orders and Money are all due today. Congratulations to the boy’s and girl’s track teams on their strong showing @ the UWSP indoor meet. AP Exam fees are due to Mr. Nelson by March 23rd. March 16: Students if you are interested in seeing a Broadway production of Les Miserables please pick up information in the High School office. Seniors you need to send any photos you want in the senior slideshow to Alexa or Karli. Attention Play Cast and Crew - We will be having practice Friday after school until 6:30 and Sunday 1 - 4:30. AP Exam fees are due to Mr. Nelson by March 23rd. March 15, 2018: Students if you are interested in seeing a Broadway production of Les Miserables please pick up information in the High School office. Seniors you need to send any photos you want in the senior slideshow to Alexa or Karli. SADD students: Kringle Orders and Money are all due THIS FRIDAY. AP Exam fees are due to Mr. Nelson by March 23rd. Wild Rose Spring Sports Schedules are now posted on the website and mobile app. Go WildCats! March 14, 2018: Students if you are interested in seeing a Broadway production of Les Miserables please pick up information in the High School office. Seniors you need to send any photos you want in the senior slideshow to Alexa or Karli. Any student who has Booster Club Raffle Tickets, sold or unsold, please return them to Mr. Yeska. AP Exam fees are due to Mr. Nelson by March 23rd. High School District Forensics @ Almond-Bancroft Tonight. Good Luck WildCats! ATTENTION: All spring sport athletes, if you have not participated in a sport yet this year, all of your paperwork needs to be turned in to your coach prior to your first practice. Seniors you need to send any photos you want in the senior slideshow to Alexa or Karli, and also bring pictures from when you were younger. AP Exam fees are due to Mr. Nelson by March 23rd. Congratulations to the middle school forensics performers who competed in the Level II meet last night. Middle School Forensics tonight @ Wild Rose. Good Luck WildCats! ATTENTION: All spring sport athletes, if you have not participated in a sport yet this year, all of your paperwork needs to be turned in to your coach prior to your first practice. Attention all Middle School students: Reminder to meet after school for our March Madness Middle School Dance. High School students interesting in joining the golf team meet in Mr. Boquist room on Monday, March 12 during CATS. Students if you are interested in seeing a Broadway production of Les Miserables please pick up information in the High School office. Any student who has Booster Club Raffle Tickets, sold or unsold, please return them to Mr. Yeska or Mr. Murphy by Wednesday 3/14. March 8, 2018 Reminder to all students and staff. We are still collecting for the Ronald McDonald house Wish list. ATTENTION: All spring sport athletes, if you have not participated in a sport yet this year, all of your paperwork needs to be turned in to your coach prior to your first practice. Attn: All Middle School Students! Reminder that Friday, March 9th is our 2nd and Last Middle School Dance of the school year. High School students interesting in joining the golf team meet in Mr. Boquist room on Monday, March 12 during CATS. Students if you are interested in seeing a Broadway production of Les Miserables please pick up information in the High School office. March 6, 2018 Reminder to all students and staff. We are still collecting for the Ronald McDonald house Wish list. ATTENTION: All spring sport athletes, if you have not participated in a sport yet this year, all of your paperwork needs to be turned in to your coach prior to your first practice. Attn: All Middle School Students! Reminder that Friday, March 9th is our 2nd and Last Middle School Dance of the school year. If you are interested in seeing a Broadway production of Les Miserables please pick up information in the High School office. All JV and Varsity Boys Basketball players, there will be a short meeting after school on Wednesday, March 7 in Mr. Komp's room to hand in equipment and discuss summer league participation. Please make every effort to be there. Feb. 28, 2018 Reminder to all students and staff. We are still collecting for the Ronald McDonald house Wish list. Students interested in taking any AP Exams. You need to tell Mr. Nelson which exams you are taking by 3:00 on February 28th. A reminder to all High School track and field athletes: All paperwork must be turned in before the first day of practice. ATTENTION: All spring sport athletes, if you have not participated in a sport yet this year, all of your paperwork needs to be turned in to your coach prior to your first practice. There will be an informational meeting for all high school athletes interested in competing in baseball for the Wildcats this spring. The meeting is during CATS time on Wednesday February 28th. March 1, 2018 Reminder to all students and staff. We are still collecting for the Ronald McDonald house Wish list. A reminder to all High School track and field athletes: All paperwork must be turned in before the first day of practice. ATTENTION: All spring sport athletes, if you have not participated in a sport yet this year, all of your paperwork needs to be turned in to your coach prior to your first practice. Middle school students who were in Art & Design first Quarter, can pick up there art work in the IMC. Good Morning. Wild Rose Schools is running a two hour delay today due to westher conditions. WildCats Win 76 - 53. Will play at home on Friday against Rosholt. Grest Job! 20 Min. until tip-off. Wild Rose vs. Wausau Newman Catholic in 1st Round of Regional Action. Go WildCats! Congratulations to all middle and high school students that participated in Solo + Ensemble on Saturday at Almond-Bancroft. 1 event got a 3 scoring, 13 events got a 2 scoring, 12 events got a 1 scoring, and 5 events got a 1 star scoring. Good job to all! Juniors: please report to the cafeteria on Monday at 2:30 to finish your ACT pretest. Congratulations to the Wrestlers and their great accomplishments at State. Tanner finished 3rd at #132, Dillon finished 2nd at #170 and Andrew finished 3rd at #182. Awesome job! Great Job Dillon! 2nd place at the WIAA State Wrestling Tournament. Amazing Job, your hard work and determination has been fantastic. Thank you for a great year! Wish Dillon good luck as he competes for State Championship tonight. The match can be seen on Fox Sports Network WI. Good Luck! Congratulations to Tanner (4-0) and Andrew (9-1) on their 3rd places finishes at the WIAA State Wrestling Meet. Thank you for your incredible hard work and determination! Great Job! Congratulations to Tanner (7-0) and Andrew (9-3) on their victories this morning. Both will wrestle this afternoon for 3rd place. Go Warriors! 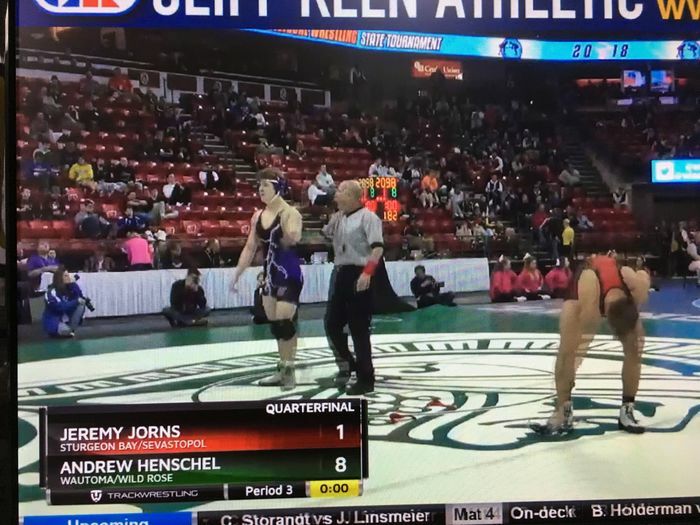 It was a good match for Andrew, but he came up just short at 4-0. Great job and good luck tomorrow morning Andrew! Dillon wins in semifinal 4-3. Wrestles tomorrow night in Championship Match. It was a good match for Tanner, but he came up just short at 14-8. Great job and good luck tomorrow morning Tanner! Andrew wins in Quarterfinals 8-1. He will wrestle again tonight. Great Job! Dillon wins in Quarterfinal 5-4. He will wrestle again tonight. Great Job! Tanner wins 6-1 in Quarterfinal Match. Great Job! Due to road conditions not improving Wild Rose Schools are closed today. Wild Rose Sxhools are delayed two hours due to icy road conditions. Boys V BBall wins 75-42 over Wega-Fremont tonight. Great Job WildCats! Henschel pins opponent in Round 1. Great Job! 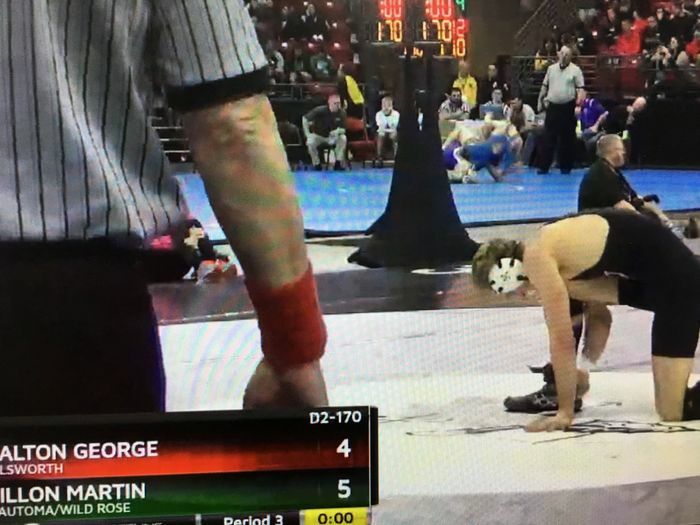 Martin wins 14-5 in Round 1. Great Job! ACT word of the day: resolve (verb) To analyze by dividing into constituent parts, solve, decide, bring to a conclusion; to make a determined effort. Feb 22,2018: Attention all high schools students interested in track and field. A informational meeting will be held on today. There will be an informational meeting for any high school girls interested in playing soccer in Mr. Murphy's room today. There will be a meeting for ANY Middle School student interested in participating in Track & Field today. Students interested in taking any AP Exams. You need to tell Mr. Nelson which exams you are taking by 3:00 on February 28th. Congratulations to Sydney and Casey for representing WRSD @ the Regional Spelling Bee. February Students of the Month:The theme for February was Organization HS: Diego Fortuno & Maddie Roemer MS 6th - Evan Tratz 7th- Emma Elm 8th - Andrew Wildner. Juniors: please report to the cafeteria on Friday at 2:30 to finish your ACT pretest. State Wrestling Tournament can be viewed online at www.nfhsnetwork.com Go WildCats! Girls Basketball Regional Game @ Loyal has been postponed to tomorrow night. Wild Rose Schools are closed today due to weather conditions. School Board Committe meeting canceled for tonight. Fitness Center closed 2/19 (PM) and 2/20 (AM) due to weather conditions. School Closing at 12:30 PM today due to weather conditions. Feb. 19, 2018 Reminder to all students and staff. We are still collecting for the Ronald McDonald house Wish list. Attention all high schools students interested in track and field. A informational meeting will be held on the 21st during CATS. There will be an informational meeting for any HS girls interested in playing soccer this year in Mr. Murphy's room on the 22nd during CATS. Please sign up if interested on Monday during CATS. ACT word of the day: hostility (noun) Unfriendliness; animosity. *All Juniors, please report to the auditorium on Wednesday at 2:30 for ACT pre-bubbling. There will be a meeting for ANY Middle School student interested in participating in Track & Field Thursday during Mr. Yeska's CATS in the Auditorium. Reminder to all students and staff. We are still collecting for the Ronald McDonald house Wish list. There will be an informational meeting for any high school girls interested in playing softball this year, during LUNCH today. Attention all high schools students interested in track and field. A informational meeting will be held on 2/21 during CATS. There will be an informational meeting for any high school girls interested in playing soccer this year in Mr. Murphy's room on 2/22 during CATS. ACT word of the Day jibe (verb) To be in accord, to agree, to fit together conceptually. There will be a meeting for ANY Middle School student interested in participating in Track & Field next Thursday during CATS. Students interested in taking any AP Exams. We will meet (Monday) at 3:15 during CATS in Mrs. Gerloff’s room. Feb. 14, 2018: Reminder to all students and staff. We are still collecting for the Ronald McDonald house Wish list. There will be an informational meeting for any high school girls interested in playing softball this year, during LUNCH on Friday, February 16. All sophomores should sign up for the sophomore class meeting on Thursday during CATS today. February 13, 2018: Reminder to all students and staff. We are still collecting for the Ronald McDonald house Wish list. Spanish Club will be selling Carnations Mon and Tues of this week for Valentine’s Day. Congratulations to the 7th & 8th grade girls basketball team on their victories over Tri-County last night. Great Job Girls! There will be an informational meeting for any high school girls interested in playing softball this year, during CATS in Mr. Murphy's room on 2/16. All sophomores should sign up for the sophomore class meeting on Thurs during CATS today. Feb. 12, 2018 Reminder to all students and staff. We are still collecting for the Ronald McDonald house Wish list. Spanish Club will be selling Carnations Monday and Tuesday of this week for Valentine’s Day. The Warriors finished in 2nd place to number 6 Lodi at Regionals this Saturday. There were 7 sectional qualifiers and 5 from Wild Rose. The Wild Rose Kiwanis has a $1000 scholarship for seniors who are in Key Club. Feb. 2, 2018 The Wild Rose Kiwanis has a $1000 scholarship for seniors who are in Key Club. Reminder that our Spring Play practices will be right after school the rest of this week. Full Cast and Tech crew should plan on attending rehearsals. Attention Staff and Students Next WEEK Tuesday, Feb. 6th, is Red Cross PJ's and Superheroes day! Bring in your change and dollars and help make this the best Red Cross event ever! Feb. 5, 2018 The Wild Rose Kiwanis has a $1000 scholarship for seniors who are in Key Club. Attn Staff and Students: Tuesday, Feb. 6th, is Red Cross PJ's and Superheroes day! Bring in your change and dollars and help make this the best Red Cross event ever! Feb. 6, 2018 Congratulations to the girl's track team for their State Runner-up finish in the Wisconsin coaches association power rankings. Congratulations to the wrestling team for winning the Conference Tournament this past weekend at Adams Friendship. Awesome job and good luck at Regionals this coming Saturday! Feb. 7, 2018 Congratulations to the 8th grade GBB team for their 26-24 victory at Almond last night. Great job girls. The Middle School Girls play this Thursday at home against Rosholt, at 5:30. Jan. 30, 2018 The Wild Rose Kiwanis has a $1000 scholarship for seniors who are in Key Club. Check the high school scholarship site for the application due March 1st. Jan. 29, 2018 The Wild Rose Kiwanis has a $1000 scholarship for seniors who are in Key Club. Check the high school scholarship site for the application due March 1st. Congratulations to Sydney for being the Wild Rose Middle School Spelling Bee Champion! Jan. 23, 2018: There will be an Art & Design club meeting Tuesday in the Art room at lunch. Today is a late start schedule with no CATS period. Tomorrow you will go to your Monday CATS and sign up for Thursday and Friday. The end of the semester is Wed., 1/24. Jan. 24, 2018: Spring Play Cast members: Wed, 1/24 5:30- 7:00 pm Boot Camp Pt. 2. Congrats to the 8th grade GBB team on their 23-12 victory last night. The next home game is tomorrow night. There will only be a 7th grade game tomorrow. Just a reminder that the Second round of our District Spelling Bee will be held at 9:00 in the auditorium Thursday. Spanish Club will have a meeting Thursday during lunch to discuss t-shirts and a fundraiser. The end of the semester is Wednesday, January 24th. Wild Rose Schools is running a two hour delay today, Tuesday, January 23, 2018. Wild Rose Fitness Center is closed tonight. MS Girls Basketball Game tonight has been postponed due to weather. School is Closed Today due to road conditions. Jan. 19, 2018 Congratulations to the 8th grade girls basketball team on their 13-11 victory over Rosholt last night. The middle school teams are home on Monday against Tri-County and the theme for the game is superhero night. Hope to see you there. Jan. 18, 2018 Congratulations to the High Quiz Bowl A team on their 102-58 victory over Almond yesterday! The next Quiz Bowl Match is home on January 31st against Amherst. Eighth grade, Freshman, Sophomore and Junior schedules for next year are past due. Please hand them in to Ms. Donati today. See Ms. Donati if you have questions. Jan. 17, 2018 We will be having a SADD meeting during CATS this week. MS is Wednesday and HS is Thursday. If you are not scheduled for a meeting please let Ms. Dohr know. Sophomore and Junior schedules for next year are past due. 8th grade and Freshman schedules are due Wednesday. Please see Ms. Donati if you have questions. Early Release Jan. 16, 2018. Jan. 16, 2018:Congratulations to the 8th grade girls basketball team on their nail-biting 23-22 win over Port Edwards last night. Sophomore and Junior schedules for next year are due today. 8th grade and Freshman schedules are due Wednesday. Just a reminder. Today is an early release day, students will be released at 1:53. Jan. 15, 2018: Come and cheer on the 7th and 8th grade girls basketball teams tonight, as they open their season against Port Edwards. The 7th grade game begins at 5:30. There will be a full team High Quiz Bowl Practice today at lunch. Just a reminder. Tuesday is an early release day, students will be released at 1:53. Hours 1-8 will meet on a shortened schedule and there will be not CATS. All afternoon and evening student activities are canceled for Thursday, Jan. 11, 2018. Jan. 12, 2018: Attention staff and students Wild Rose Teacher Team - "Relay for Life" Pizza orders are due today. Come support the Wild Rose Boys and Girls Basketball team and White Out Hunger. Friday night is the annual Blizzard in the Gym. Wear white and bring a non-perishable food item to get in free. The Girls Varsity game starts at 6:00pm and the Boys Varsity Game starts around 7:30pm. The Boys JV game is a 6:00pm in the cafeteria gym. Sponsored by Key Club. Several cast and crew still owe money for your Seussical T-shirts. Take time today to make someone else’s day. Say something nice, do something nice, or just simply be nice. Jan 11, 2018: Attention staff and students: Wild Rose Teacher Team - "Relay for Life" Pizza orders are due Friday. Come support the Wild Rose Boys Basketball team and White Out Hunger. Friday night is the annual Blizzard in the Gym. Wear white and bring a non-perishable food item to get in free. Sponsored by Key Club Congratulations to the High Quiz Bowl B team for their 115-79 victory over Tri-County yesterday. The High Quiz Bowl Teams are home next Wednesday as they take on Almond beginning at 12:45 in the auditorium. Several cast and crew still owe money for your Seussical T-shirts. Jan 10, 2018: Attention staff and students: Wild Rose Teacher Team - "Relay for Life" Pizza orders are due Friday. If you are interested in ordering Pizzas please turn in your order form to Mrs. Miller, Mrs. Friedel or Ms. Dohr. Reminder that today, Wednesday, all High School students interested in helping in the Spring Play with Set and tech should attend a short meeting after school in the auditorium. Jan. 8 Daily Announcements: Wild Rose Teacher Team - "Relay for Life" Pizza orders are due Friday. If you are interested in ordering Pizzas please turn in your order form to Mrs. Miller, Mrs. Friedel or Ms. Dohr. Wild Rose High School's Spring Play Cast and Crew is posted outside of the HS Office. Thank you to everyone who attended tryouts and auditions. Take time today to make someone else’s day. Say something nice, do something nice, or just simply be nice. Jan 5, 2018 Daily Announcements: Congratulations to the High Quiz Bowl B-Team for their 238-30 victory over Manawa Yesterday. The teams head to Tri-County next week, before returning home to face Almond on January 17th. Boys basketball players should be in the sports lobby by 4:10 this evening for the trip to Manawa. Jan 4, 2018 Daily Announcements: Attention HS students: Auditions for the Spring play will be held in the auditorium after school today. All high school students are invited to attend and try out for this fun play. Set and tech crew are also encouraged to attend auditions. Dec. 18, 2017: MS/HS school students. Please leave your backpacks in your locker during the day. 9th-12th graders please fill out the Post-Prom interest survey. Any 6-8th grader that is interested in participating in MS Wrestling this year, please see Mr. Murphy before the end of the day on Tuesday. Tryouts for spring play will be held after school Jan 3 and 4. Dec 19,2017: MS/HS school students. Please leave your backpacks in your locker during the day. 9th-12th graders please fill out the Post-Prom interest survey. Any 6th, 7th, or 8th grader that is interested in participating in Middle School Wrestling this year, please see Mr. Murphy before the end of the day on Tuesday. Tryouts for spring play will be held after school January 3rd and 4th. Attention all Seniors -Senior portraits and baby picture(s) are due no later than FRIDAY, 12/22. Dec 20, 2017: MS/HS school students. Please leave your backpacks in your locker during the day. 9th-12th graders please fill out the Post-Prom interest survey. Tryouts for spring play will be held after school January 3rd and 4th. Staff and Students. Attention all Seniors -Senior portraits and baby picture(s) are due no later than FRIDAY, 12/22. Dec 21, 2017: MS/HS school students. Please leave your backpacks in your locker during the day. 9th-12th graders please fill out the Post-Prom interest survey. Tryouts for spring play will be held after school Jan. 3 & 4. Staff and Students. Attn all Seniors -Senior portraits and baby picture(s) are due no later than FRIDAY, 12/22. Dec 22, 2017: 9th-12th graders please fill out the Post-Prom survey. Attn all 7th and 8th grade girls basketball players, just a reminder that practice begins Wed Jan 3. Tryouts for the Spring Play will be held after school Jan 3 & 4. Attn all Seniors-Senior portraits and baby picture(s) are due no later than FRIDAY, 12/22. Jan 3, 2017 Daily Announcements: High Quiz Bowl Practice today during lunch. MS Band Members, please bring your Chromebooks to band class today. Attention HS: Auditions for the Spring play will be held after school Wed. & Thurs. Dec. 15, 2017 Daily Announcements: The middle school winner of the canned food drive is Mr. Murphy and the high school winner is Mr. Boquist. The winner of the door decorating contest in the middle school is Mrs. Nelson and the winner in the high school is Mrs. Friedel. Thank you to all who participated. Your rewards will be coming next week!! Middle/High school students. Please leave your backpacks in your locker during the day. This includes 8th hour and CATS time. If we need the buses to wait an extra minute we will. Thank you. Take time today to make someone else’s day. Say something nice, do something nice, or just simply be nice. Dec. 14, 2017 Daily Announcements: Student of the month. Our theme for the month is December - Perseverance. Perseverance is a skill you will need throughout your life! Never give up, work hard and make it happen! 6th Grade: Marisol Garcia 7th Grade: Cody Dalle Ave 8th Grade: Josie Worthen High School: Anna Caswell and Lucas Koester There will be a meeting for all High Quiz Bowl Team Members and Statisticians this Thursday during lunch in Mr. Yeska’s room. You will get a copy of the schedule and we will discuss practice times at this meeting. Take time today to make someone else’s day. Say something nice, do something nice, or just simply be nice. Dec. 12, 2017 MS/HS Daily Announcements: There will be a meeting for any 7th and 8th grade girls interested in playing basketball this season, on Tuesday December 12, during CATS in Mr. Yeska’s room. Sign up on Monday to attend. Any boy who played 7th or 8th grade basketball, please see Mr. Komp by the end of the day. Take time today to make someone else’s day. Say something nice, do something nice, or just simply be nice. Dec. 11 MS/HS Daily Announcements: There will be a meeting for any 7th and 8th grade girls interested in playing basketball this season, on Tuesday 12/12, during CATS in Mr. Yeska’s room. Sign up on Monday to attend. Take time today to make someone else’s day. Say something nice, do something nice, or just simply be nice. Dec. 7, 2017 Daily Announcements: Thursday is the last day to bring in non perishable foods and thank you to all who have participated thus far! There will be a meeting for any 7th and 8th grade girls interested in playing basketball this season, on Tuesday 12/12, during CATS in Mr. Yeska’s room. Sign up on Monday to attend. Dec. 6, 2017 Daily Announcements: Attention Key Club members : There will be a meeting today during lunch in Mrs. Gerloff's room. Here is an update on the Canned Food Drive points after Tuesday's collection: In the middle school, Mr. Eichman and Mr. Komp are tied with 16 pts while Mrs. Miller has 9 pts. In the high school, Mrs. Nelson has 9 pts. Thursday is the last day to bring in non perishable foods and thank you to all who have participated thus far! There will be a meeting for any 7th and 8th grade girls interested in playing basketball this season, on Tuesday 12/12, during CATS in Mr. Yeska’s room. Sign up on Monday to attend. Dec. 5 Daily Announcements: Attention all staff and students: The annual canned food drive has begun and will go through Thursday, December 7th. All donated items support the Waushara County Community Christmas Project. High Quiz Bowl tryouts are this week. You MUST take all three tests to be considered for the team. If you have any questions talk with Mr. Yeska. Spanish club will be meeting in Ms. Strasser’s room during lunch today. Dec. 4 Daily Announcements: Attention all staff and students: The annual canned food drive has begun and will go through Thursday, December 7th. All donated items support the Waushara County Community Christmas Project. High Quiz Bowl try outs are this week. If you have any questions talk with Mr. Yeska. December 1, 2017 Daily Announcements The Menu has changed for Monday’s lunch, it will be changed to Orange Chicken. Attention all staff and students: The annual canned food drive has begun and will go through December 7th. All donated items support the Waushara County Community Christmas Project. High Quiz Bowl tryouts will be next week Tuesday and Thursday during Mr. Yeska’s CATS. Congratulations to the 7th grade boys basketball team on their 29-26 Overtime win against Pittsville last night. What is American Education Week? American Education Week—November 13-17, 2017—will present all Americans with a wonderful opportunity to celebrate public education and honor individuals who are making a difference in ensuring that every child receives a quality education. The School District of Wild Rose... will provide a challenging education to prepare our students to be knowledgeable, resourceful, resilient, and productive members of our ever changing world. The School District of Wild Rose serves approximately 600 students in and around the communities of Pine River, Saxeville, and Wild Rose.